Hanoi (VNA) – Vietnam’s key sport events like track & fields, swimming, shooting and gymnastics are expected to help its sport delegation secure the third place at the Southeast Asia Games 29, the position that it has retained since 2003. Some 476 Vietnamese athletes are ready to compete in 32 out of 38 sports events, eyeing to bring home 50-59 gold medals and rank in the top group of the biennial Games, which is scheduled in Malaysia from August 19 to 31. Earlier, Vietnam targeted a goal of at least 65 golds and then adjusted it as Malaysia, the host country, decided to remove events of Vietnam’s strength like wrestling, rowing, canoeing, women’s boxing, women’s fencing and women’s weightlifting. This year’s event, the track & field team will strive to garner 10-12 gold medals. Quach Cong Lich, Quach Thi Lan and Nguyen Thi Huyen are believed to bring glory to the team. Swimmers Nguyen Thi Anh Vien, Lam Quang Nhat, Nguyen Huy Hoang and Nguyen Huu Kim Son are expected to play key roles in helping the swimming team to grasp 10-11 golds. 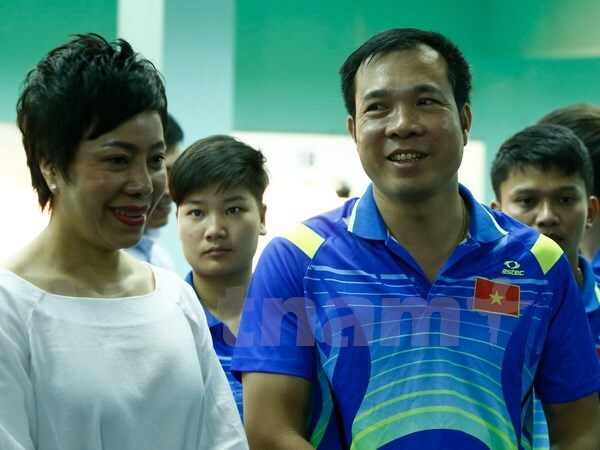 Meanwhile, shooting coach Nguyen Thi Nhung affirmed that marksmen Hoang Xuan Vinh and Tran Quoc Cuong will make it big in their forte, including ten metre air pistol and 50 metre rifle prone individual. The Vietnamese delegation will face fierce competition from Indonesia, Malaysia, the Philippines, Singapore and Thailand who have meticulous preparation for the regional sport games. With advantage as a host, Malaysia is likely to rank first in the medal tally. Thailand owning strongest sport in the region is said to come at second place. Thus, Vietnam, Singapore and Indonesia will vie for third place. In the previous Games in Singapore, Vietnam stood third, with 73 golds, 53 silvers and 60 bronzes.